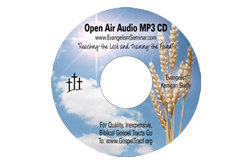 This is an MP3 CD with lots of audio of Kerrigan open air preaching. You can hear him preaching at many different major universities as well as on the streets. When Kerrigan first got started open air preaching, one of the things that helped him the most was hearing and watching others open air preach. We pray this will be an encouragement to you as well. Around 50 mp3 audio files and about 24 hours worth of preaching!